If I made a list of my ten favorite aircraft, the C-130 Hercules would appear somewhere in that list. It is basically a railroad boxcar with wings, a huge tail, and a funny shaped nose, but I like it. 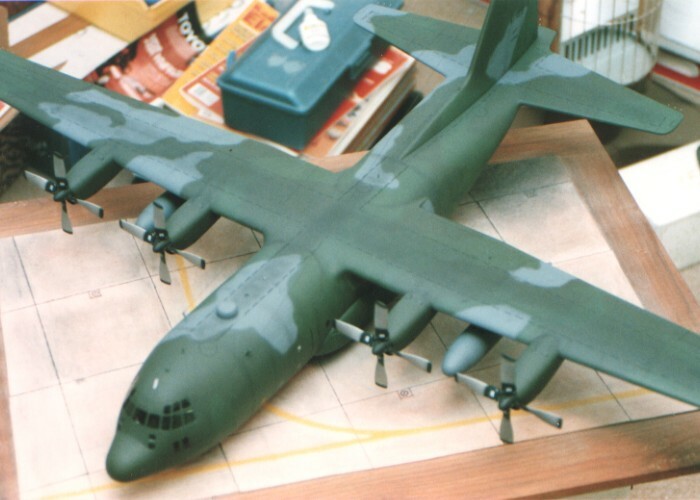 Back in the 1980s, I had already zeroed in on 1/48th scale as my scale of choice. 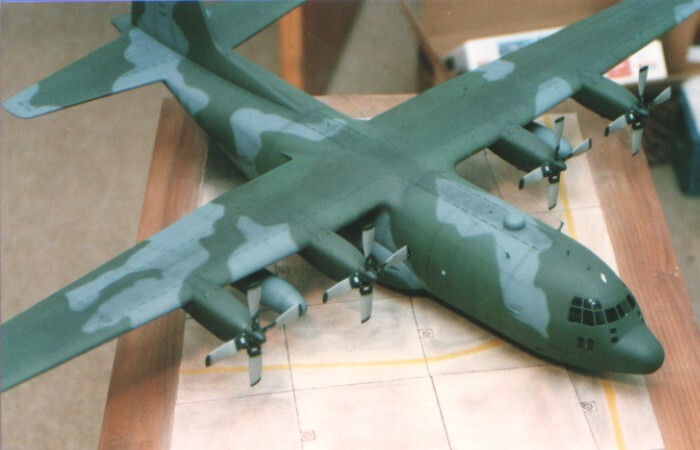 As such, I was very happy when Testor / Italeri released a 1/48th scale C-130E, the classic cargo version of the Hercules. 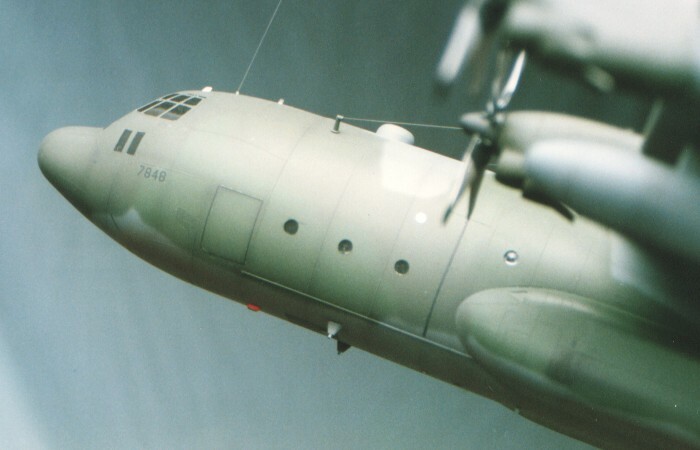 They also released an AC-130A Spectre, but discussion of that model can wait for another time. 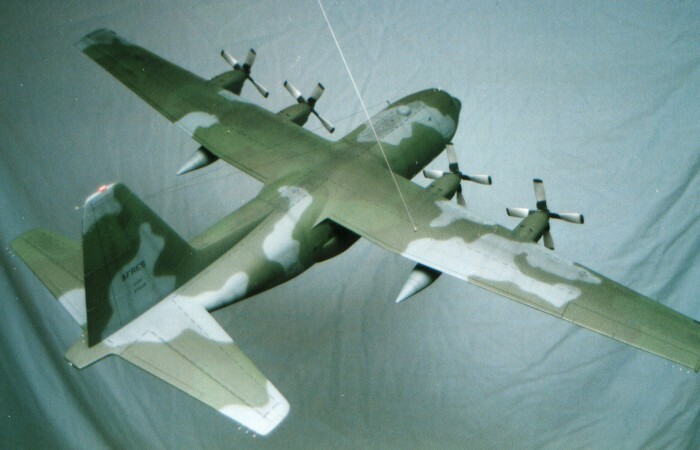 I wasted no time picking up a few C-130 kits right after they were released in the middle 1980s. The local toy store near my house got a shipment and priced them at only $26.95 each. I swear this must have been a mis-pricing, but I was not going to complain. The model, today, is only available from Italeri and runs in the $70 to $80 range. In the years between 1985 and 1988, I built no less than four of these massive kits. All but one were built as contract jobs for people that crewed or worked on the C-130. This model was my second build of the kit, and it was the one that was intended to be for me. I ended up selling it to another C-130 crew person for $100 plus a guided tour of the C-130 flight line at an airbase near my home. I felt this was a good exchange. The Testor release of this kit comes in a three foot long box. Inside this box are two smaller boxes. One holds the major airframe components, the other holds most of the details. The kit is molded in light gray and has raised scribing. A representation of the interior is provided, but I chose to leave the interior out of this model. By painting all the windows black (from the inside) and closing all the entry doors, I built the model in flight and saved the time and trouble of working on the interior portions. Notable in the parts break-down, the fuselage halves are each, themselves, split in half. The split occurs at the vertical panel line directly in front of the wing, close to where the propeller warning stripes are applied. The instructions tell you to build the rear fuselage and forward fuselage independently from each other, then attach them together. I learned on my first build of this kit that this construction sequence does not work well. You are left with an ugly seam to fix running all the way around the fuselage. Instead, attach the forward and rear fuselage pieces to each other before assembling the whole fuselage. This allows you to address the seam more easily and adjust the fit while you can still manuever the pieces. It also provides the opportunity to reinforce the joint from the back side (inside the fuselage). This can be important as the weight of the model is substantial when completed. Without the reinforcing, the risk of splitting the fuselage is greater. Another thing I learned about the construction and painting of the kit involves the wings. I found it was much easier to leave the wings off until the end of the project. I assembled the wings and fuselage independently. I painted, applied decals, flat coated, and weathered the wings and fuselage while they were separate. Then, at the end of the project, I attached the wings and carefully cleaned up the wing seam. The day of extra care while dealing with the wing seam was much better (IMHO) than weeks of handling the model with the wings attached. Most prominently, I added the "tophat" Station Keeping Equipement (SKE) antenna to the upper forward fuselage. I scratch built this antenna using sheet styrene and a cross-section piece cut from an F-15 external fuel tank. I investigated numerous reference pictures I had taken to determine all the assorted blade antennae around the fuselage. I added these from scratch using sheet styrene. There are some external plumbing lines on the outboard engine nacelles that I added with strip styrene. I added the red rotating beacon lights under the fuselage and on top of the tail using laminated sheet styrene that I later painted red. I added the small blue formation lights to the tops of the wings and fuselage using small platic card disks the I punched out with my Waldron punch set. I added all the static discharger "whiskers" to the trailing edges of the wings and tail using thin fishing line inserted into holes I drilled into the trailing edges. I added the line antennae running from the forward fuselage to the upper tail leading edge. The last "extra" I did to the model was to incorporate wire eyelets in the wings and forward fuselage to use as hanging points for the model. These are visible in the pictures of the model. I used Testors Model Master paints exclusively on this model. 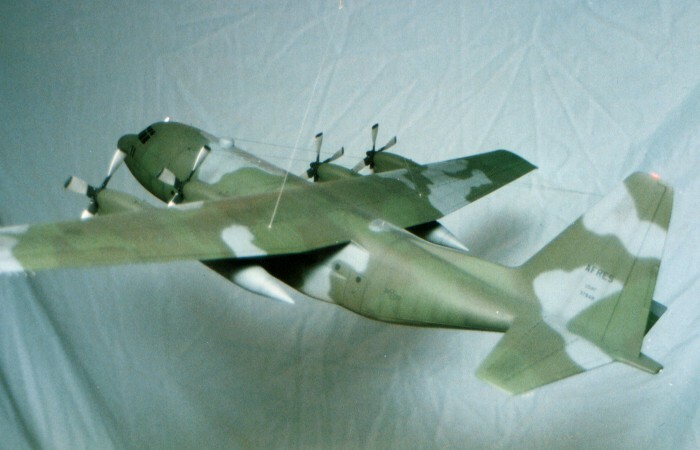 Camouflage is the standard European II scheme (for the C-130) with Dark Green (F.S.34079), Medium Green (F.S.34102), and Gunship Gray (F.S.36118). This is similar to the European II scheme applied to F-4 Phantom IIs only the Phantoms used European Gray (F.S.36081) as the gray color. Of the two schemes on the C-130, European I and European II, I prefer the European II scheme better. 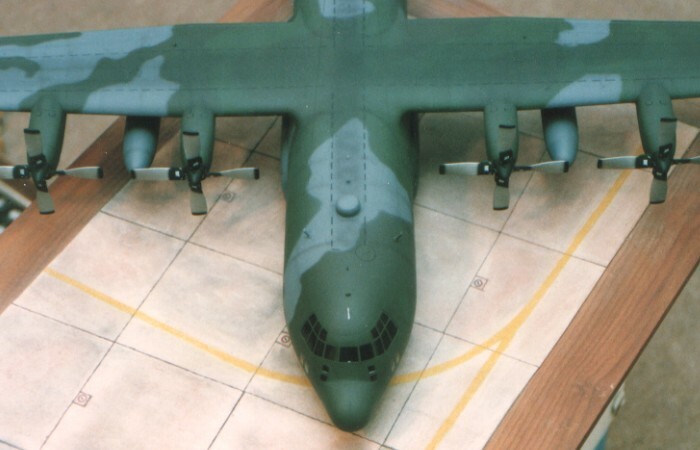 The "browner" Dark Green color looks better on the C-130's bulky lines (to me) than the "bluer" European Green. For markings, I used the kit decals and added the "AFRES" titles on the vertical tail so the aircraft could be interpreted as a locally based 913th Tactical Airlist Group aircraft. To better represent a local aircraft, I revised the serial number on the tail to be one of the exact aircraft from the 913th TAG. This touch proved to be my undoing at being able to keep the model. I was displaying the model in a local hobby shop (where I worked part-time) when in walked the crew chief for that exact aircraft. Now, how could I not sell the model to the crew chief of the aircraft? For weathering, I used my typical style of thinned down enamel paint washes and air brush shading. For a more complete discussion of what I do to weather my models, see my posting on "Weathering Aircraft". To better represent the look of an aircraft that has just practised a Low Altitude Parachute Extraction System (LAPES) delivery on a dirt strip, I did the airbrush shading on the lower fuselage in both black and several shades of brown and sand. I also used some browns and sand colors in the engine exhaust stains to enhance their appearance. The effects of these techniques were quite pleasing. I followed this with some silver dry-brushing to pop out detailing. This is a massive kit (over two feet in both length and width), but it is worth building (assuming you have the space to keep it). 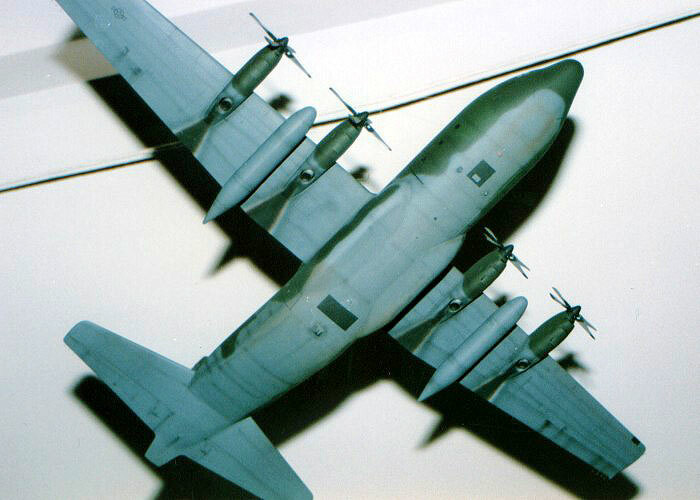 Squirreled away in my attic are one DC-130A, six more C-130E, and two AC-130A kits waiting their turn to be built. Eventually, I'll finish one of these that I will be able to keep for myself.